OK here’s a mix i did a few months ago for VIA pgh and i just took another listen and really think it’s good. So check it out. Adventure has never been a task for VBC. A Caribbean soul and a California heart have sustained over a decade of ceaseless romp-downs and raucous times for L.A.’s vallenato veteranos, inciting 10s of 1000s of men, women, children, and even some wild animals, to boogie to the Colombian coastal beat. From the debaucherous streets of: Austin’s SXSW, Germany’s WorldCupTour ’06, L.A.’s SunsetJunctionStreetFair; to the cultural pinnacles of: Chicago’s SummerDanceSeries, New York’s CentralParkSummerstage, L.A.s’ GrandPerformances & Levitt Pavilion, London’s HammersmithApollo; colossal concerts: L.A. Sports Arena CumbiaFest, GlastonburyMusicFestival & Bestival UK, FujiRockFestival & AsagiriJam Japan; clubs and hubs: N.Y.’s SOBs, L.A.’s HOBs, backyard BBQs, VeryBeCareful has tamed the beasts within or unleashed the ones without, helping to popularize the beauty of the 1950s-1970s sound of Colombian vallenato and cumbia. 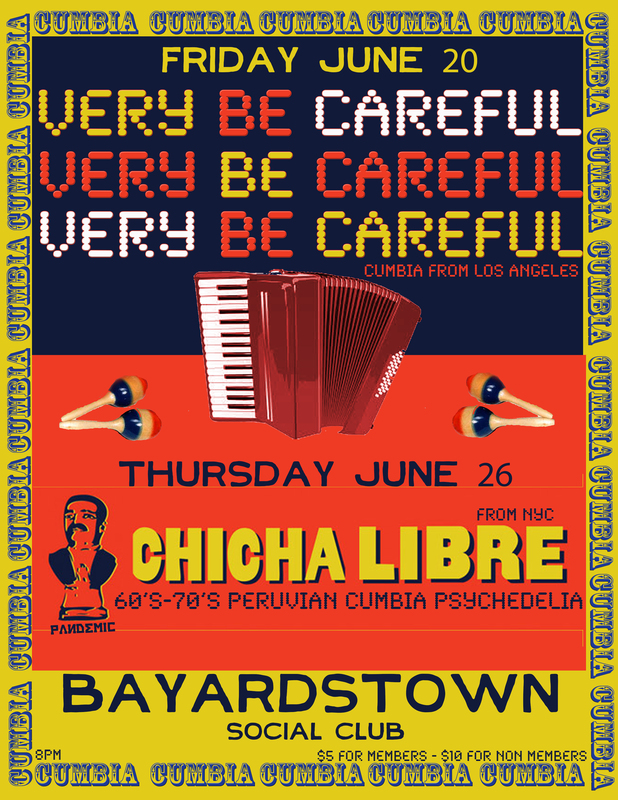 Chicha Libre plays a mixture of latin rhythms, surf music and psychedelic pop inspired by Peruvian music from Lima and the Amazon. The Brooklyn-based band mixes up covers of forgotten Chicha classics with French-tinged originals, re-interpretation of 70’s pop classics as well as cumbia versions of pieces by Satie and Wagner. Chicha is the name of a corn-based liquor favored by the Incas in pre-colombian days. Chicha is also the name of Peru’s particular brand of cumbia made popular in the late 60’s by bands such as Los Destellos, Manzanita, Los Mirlos and Juaneco y su Combo. Chicha was loosely inspired by Colombian accordion-driven cumbias but incorporated the distinctive pentatonic scales of Andean melodies, some Cuban son, and the psychedelic sounds of surf guitars, farfisa organs and moog synthesizers. Peruvian chicha bands were playing an oddly post-modern combination of western psychedelia, Cuban and Colombian rhythms, national melodies and idiosyncratic inventions which were close in spirit to both the Congolese rumba of Franco and the pop syncretism of Os Mutantes. and also did you hear about the WHAT CHEER? movie.